After a rather horrific string of events that culminated during Outlander Season 2 Episode 7, Claire and Jamie came to the decision there's no place like home. They're going to return to Scotland. I don't think it's any coincidence they reached that conclusion in the same hour Claire thought of the line "I'll miss you most of all" about Master Raymond, either. Unfortunately, Claire and Jamie aren't going to wake up. The unpleasant time they spent in Paris isn't going to disappear with a click of their heels. And seriously, has this outing been an absolute nightmare or what? They're going home having accomplished nothing. They're worse off now than they were when they arrived. They're closer, but their relationship is splintered. Black Jack is still between them. Their baby is gone. Culloden will still happen. I'm assuming the brief glimpse of Claire and her daughter in 1954 was to act as a salve against the pain and torture coming our way. A buffer to let us know while it looks like all might be lost, when Claire thinks Jamie is dead in the future, she'll at least have his daughter while she's living with Frank. Ummm...that's not necessarily at happy future, but I guess we'll take it, right? So Claire lost their baby, and Jamie wasn't anywhere to be found. It's not the best time to be in the Bastille. It amazes me how Claire manages to make such fast friends wherever she goes (or such brilliant enemies). She could have never gotten through the physical turmoil and the emotional pain she suffered without Mother Hildegarde, Master Raymond and Louise. 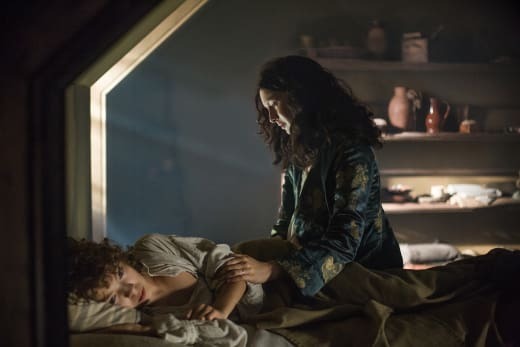 I'm grateful they didn't share the entire story of Faith's birth and Claire's journey until she reunited with Jamie, because it made a much greater impact being able to hear it with him, after she had gone through so much more, and so stoically, to boot. If I was skeptical of the type of friend Louise could really be to Claire given her tittering girlfriends always at the ready, that was obviously a mistake. She was there when Claire needed her the most. Being there when pregnant herself couldn't have been easy. The only thing I wish I understood a little bit better was the timing of the events. I suppose Claire must have held Faith soon after delivery, but the way she asked about her days later and received information from Mother Hildegarde makes it a little bit confusing. It really doesn't matter. 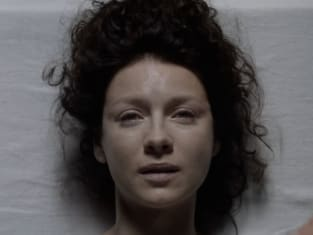 What does matter is Caitriona Balfe was incredible in those scenes; all the scenes, really, and in an hour that was really 60 minutes long, and she was featured in pretty much every scene. She needed to find out what happened to Fergus to let go of some of her anger for Jamie, but of course it didn't help at all. 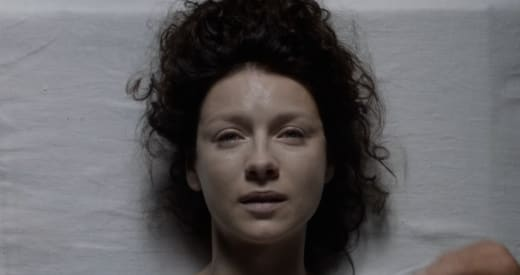 It did push her to find a way to get Jamie out of the Bastille, but she still harbored so much rage inside. Mother Hildegarde: The King is a mercurial man. There is a price to such requests. Mother Hildegarde: The King may expect to lie with you. Permalink: The King may expect to lie with you. Claire didn't even blink at the idea the King would want to sleep with her to set Jamie free. It was like another day in Claire's life. La di da, she'd do what she'd have to do. She had her emotions pretty safely tucked away. She really had her flirt on when she arrived in the King's chamber, and when she initially put down her orange to walk toward the bed, I was immediately concerned she get that back. It was so irrational, yet I wasn't alone. She did leave that chamber with the orange! It looked so good, didn't it? When King Louis wasn't taking women he believed to be witches into his secret room stalked with an executioner and with a pentagram type symbol on the floor, what do you think he did with it? He was probably angry with the occult because it didn't work out for him. Nonetheless, he wanted Claire to determine the fate of two supposed practitioners of the dark arts. It wasn't surprising to see Master Raymond there, but Comte St. Germain was another matter. It was initially kind of fun watching Claire toy with Germain. He needed to sweat a little. But I was also on board with Claire's idea to point to the darkness in all men, which allowed for a little light. He's a total jackass and didn't deserve to be walking the streets, but to kill him outright in that room was completely different. 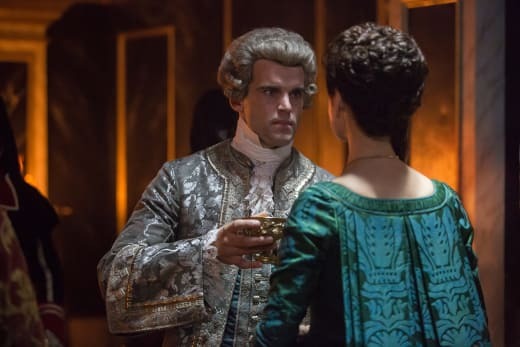 When Black Jack Randall gets a pass, even a year-long stay of execution for whatever reason, it's unfair to condemn Comte St. Germain to death. But Master Raymond didn't feel the same way. That guy truly is a magician. Still, watching Germain cry and pulsate on the floor? Unpleasant. The look on Claire's face when she learned she was still going to make another payment to get Jamie out of the Bastille was priceless, but when she actually made said payment, all I could think of was, "that's what all the fuss was about?" Heck, if the women knew that's what a favor would cost them, the women of Paris would be lined up outside King Louis' bedroom door. When Jamie arrived home and Claire told him the entire story, it only felt complete when she finally accepted her part in the whole thing. She asked the impossible of Jamie, followed him to the woods and put Frank before her family. Nothing they did makes either of them culpable for what they've been through. Claire: There's something else. I slept with the King. Jamie: You did it to save my life. Just like I slept with Randall to save you. Permalink: You did it to save my life. Just like I slept with Randall to save you. There was really nothing left that they could possibly do in Paris. They've been through the ringer. They just want to go home. It's so sad they're leaving Faith behind, but she's with some of the best friends Claire has ever had. You can't beat that. Will they still try stopping the battle at Culloden? It has to be difficult to admit defeat knowing everyone you love is in peril, especially when you've met some of the players and find them utterly ridiculous. Will they take Fergus with them? They've at least gotten a son out of this, right? I sure hope he's part of their family now. I'm ready to see Claire and Jamie slow down a little bit and remember they love each other. Stop trying to save the world and save their marriage. They came too close to losing each other over trying to change the future. They have now. What did you think of this emotional and somewhat crazy episode? I know it was somewhat different from the book, too, so leave your thoughts in the comments! Fergus: It's not just a dream. Claire: What Englishman? Fergus. Tell me. Permalink: What Englishman? Fergus. Tell me. My husband betrayed me, Mother. Revenge mattered more to him than me, or his child. Permalink: My husband betrayed me, Mother. Revenge mattered more to him than me, or his child.